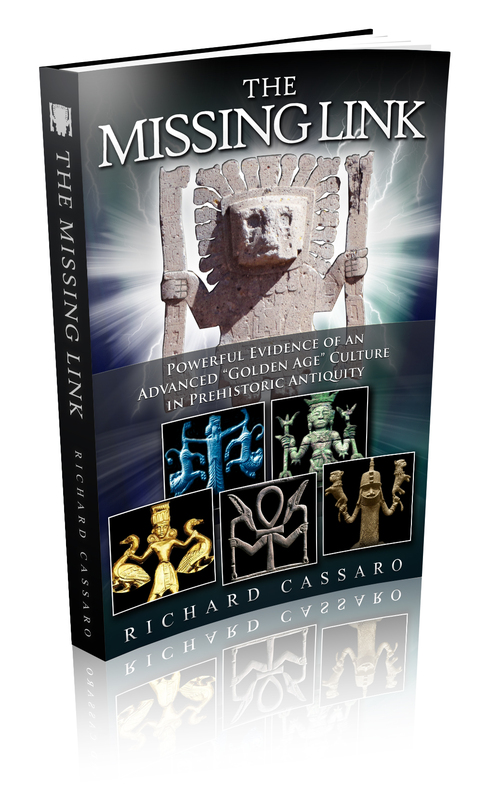 My new book, The Missing Link, focuses on what I call the “GodSelf Icon.” I´ve found it in every major ancient culture that built pyramids—in the Americas, Africa and Asia. 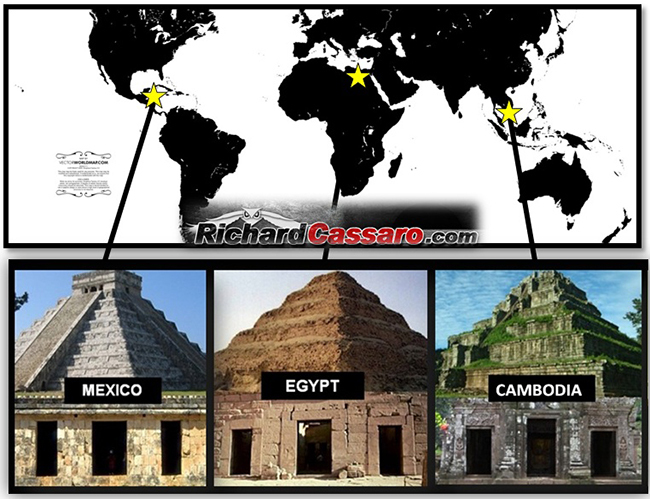 The GodSelf Icon is “THE MISSING LINK” connecting these ancient pyramid cultures to each other, and possibly to an earlier advanced Golden Age Mother Culture, a “lost civilization” so remote it´s been forgotten. 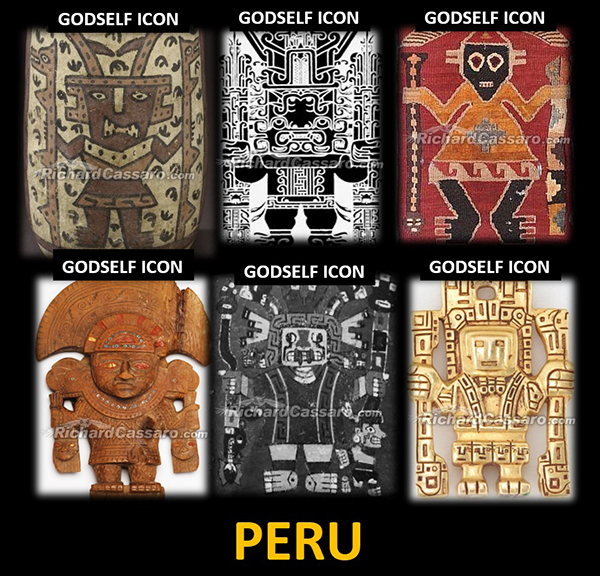 The GodSelf Icon depicts a human or human-like figure facing forward, holding twin objects symmetrically in each hand. These objects are usually staffs or animals,sometimes serpents. 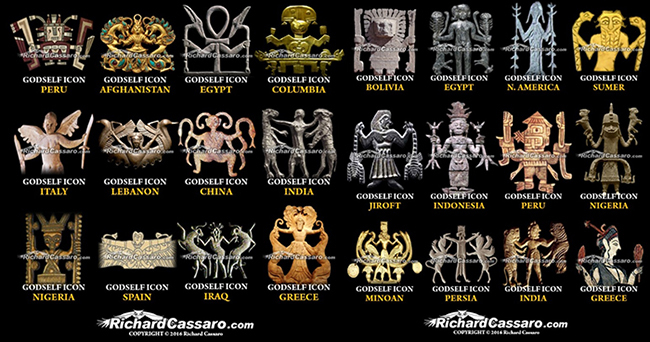 GodSelf Icons can be found among ancient cultures worldwide. The center door is the “source”—the “god within” or “soul within” us, which is who we really are. The twin doors are the opposing bodily forces of duality that surround the soul on either side, and that the soul must confront and masterin life. 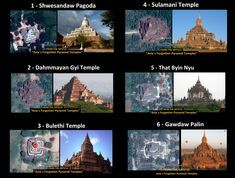 Triptych Temples stand as evidence of an ancient worldwide religion. 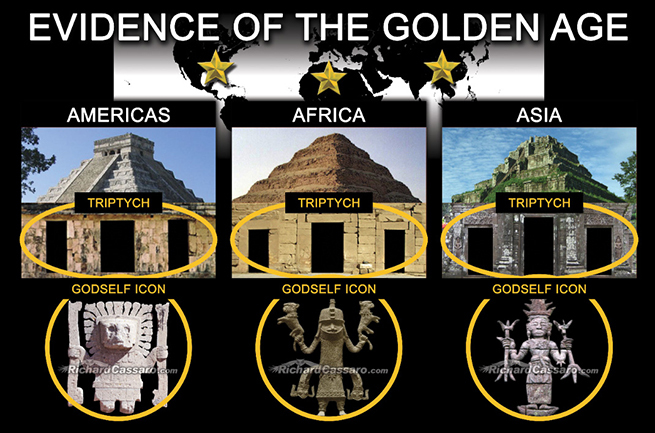 I explained how these Triptych Temples are artifacts of a “Universal Religion” that flourished globally in the remote past, and I claimed that this Universal Religion may be evidence of a prehistoric Golden Age. The hallmark of this Golden Age was the creation of unusually advanced monuments of stone. Such feats required tremendous powers of concentration and cooperation in situations where the smallest mistakes could be fatal. 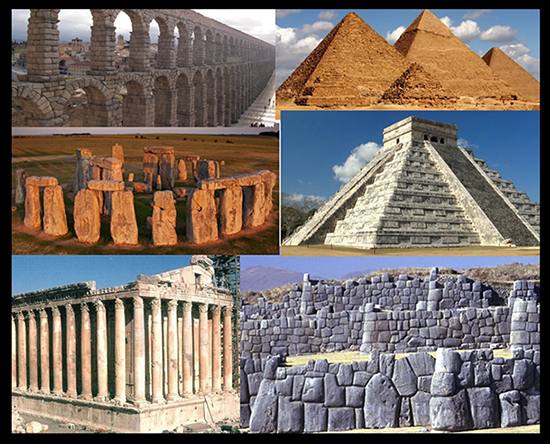 The world´s most ancient monuments are also the most advanced; all are made of stone. This shared craftsmanship and mutual dependency fostered a feeling of brotherhood and promoted a heightened spiritual development. The “rough ashlar” came to symbolize the entered apprentice. 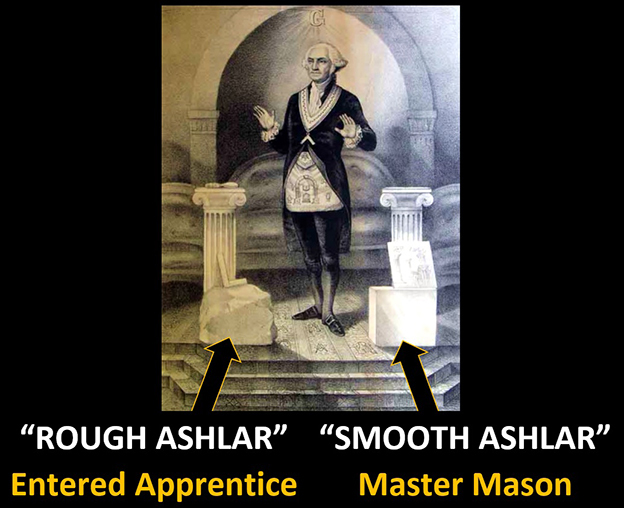 The “smooth ashlar” was the master mason. It was incumbent upon the apprentice to transform himself into a master. Many of the structures these ancient masons built—all of which were made of stone—were based on the Triptych pattern, which to them had a spiritual and symbolic significance. 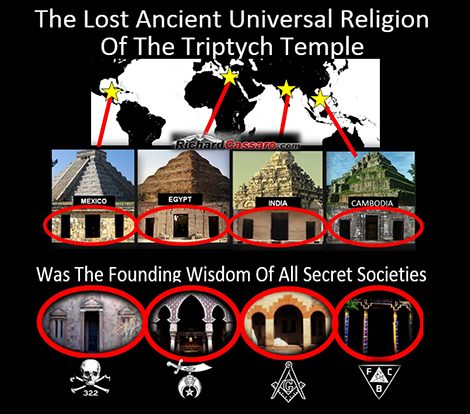 of the Triptych Temple was the founding wisdom of Western Secret Societies. In The Missing Link, I show how the GodSelf Icon means the same thing as the Triptych Temple. The GodSelf Icon represents the soul of the hero or sage who balances his opposing bodily forces, represented bythe twin objects held symmetrically in each hand. 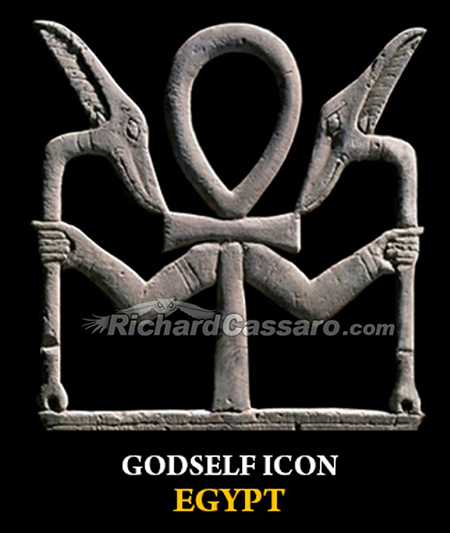 GodSelf Icon in ancient Egypt that takes the form of the Ankh Cross. In Egypt, the ankh cross of life was often depicted as a GodSelf Icon because it represented the eternal part of us, the spiritual center within us that we find when we balance our opposing twin sides. The god Osiris, who was the role model for Egypt´s masses, was often depicted as a GodSelf Icon. For the Egyptians, this hieroglyphic symbol, called “Heh,” had a single profound meaning. 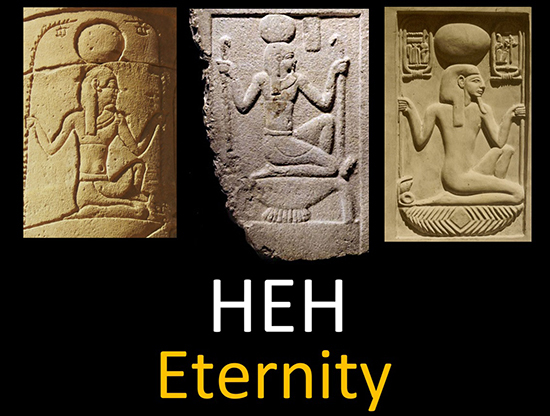 The Egyptian symbol “Heh” is a GodSelf Icon; it stands for “eternity” in hieroglyphics. It stood for “ETERNITY”—a clear reference to the eternal within us, our spiritual center or “soul within” that was never born and never dies. One of Egypt´s earliest GodSelf Icons is the powerful god “Bes,” depicted here atop the high columns of a famous Egyptian temple in Dendera. Incredibly, this depiction of Bes is nearly identical to a GodSelf Icon carved on the Gate of the Sun in Tiahuanaco, Bolivia, halfway around the world. 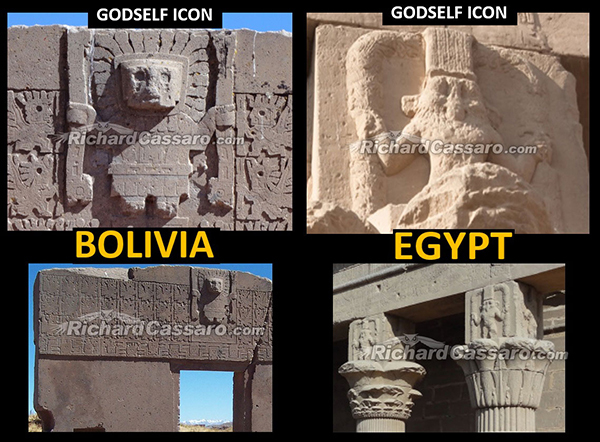 GodSelf Icons can be found across the Atlantic Ocean, here shown in both Egypt and Bolivia. Here, the creator god Viracocha of the Andes, strikes the same GodSelf Icon pose as Bes. and pre-Inca cultures of Peru for thousands of years. Based on these parallels, it almost seems as if the Egyptians and pre-Incas were sister civilizations—descendants of the same Golden Age Mother Culture and inheritors of the same Master Mason tradition. Both cultures left megalithic stonemasonry so advanced they leave modern visitors in awe. 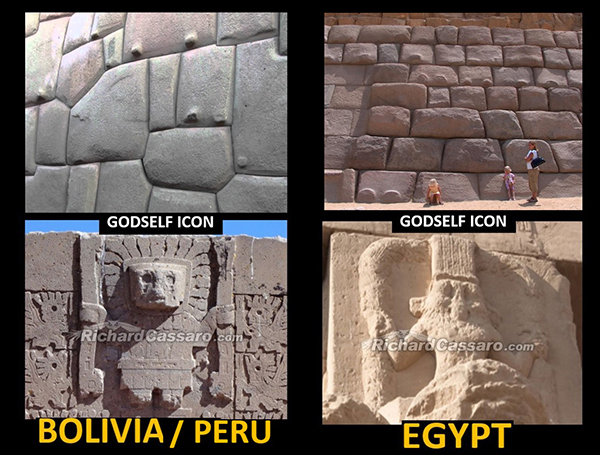 GodSelf Icons are present in cultures where advanced stonemasonry is also present. 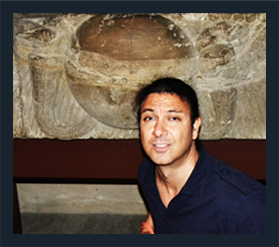 Just as the GodSelf Icon was a central image for the Egyptians and pre-Incas, we also find it right at the beginning in India, the birthplace of Hinduism and home of many advanced megalithic stone monuments. 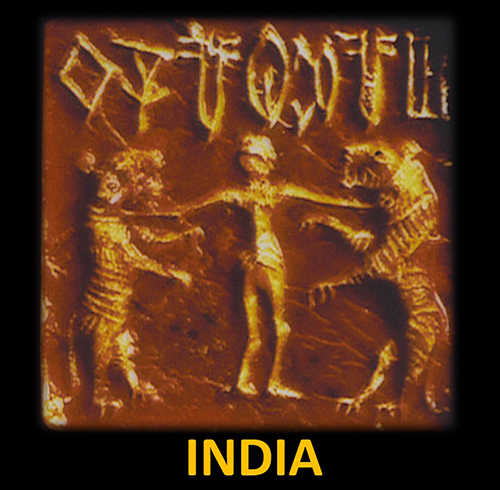 The Indus Valley civilization, the first known culture in India, produced brilliant examples of GodSelf Icons. Certain key aspects of Hinduism—such as non-duality and “finding the center between opposites”—clearly reflect the ideas associated with the GodSelf Icon. One of India´s most important early symbols is the GodSelf Icon, as shown above. 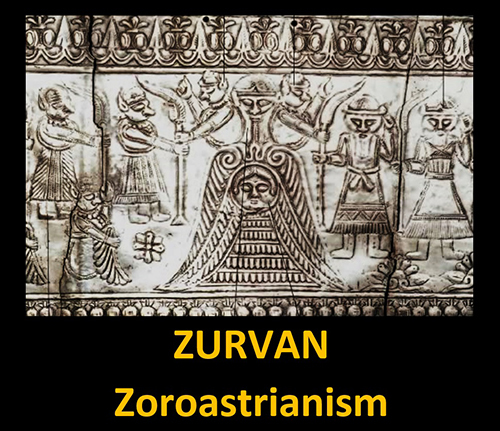 The ancient Persian deity, Zurvan, is here shown taking the form of the GodSelf Icon while giving birth to Ahura Mazda and Ahirman (good and evil) on both sides, right and left. Persia was home to Zoroastrianism, whose chief god, Zurvan, was represented as an androgynous figure in the form of a GodSelf Icon. He balanced himself between Ahura Mazda on the side of good against Ahriman on the side of evil. 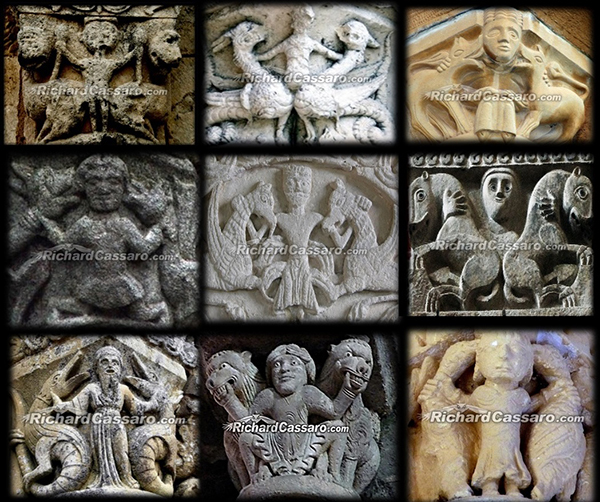 Medieval operative Freemasons used GodSelf Icons to decorate their churches, castles and cathedrals—indicative of the GodSelf Icon´s importance in antiquity and esotericism. 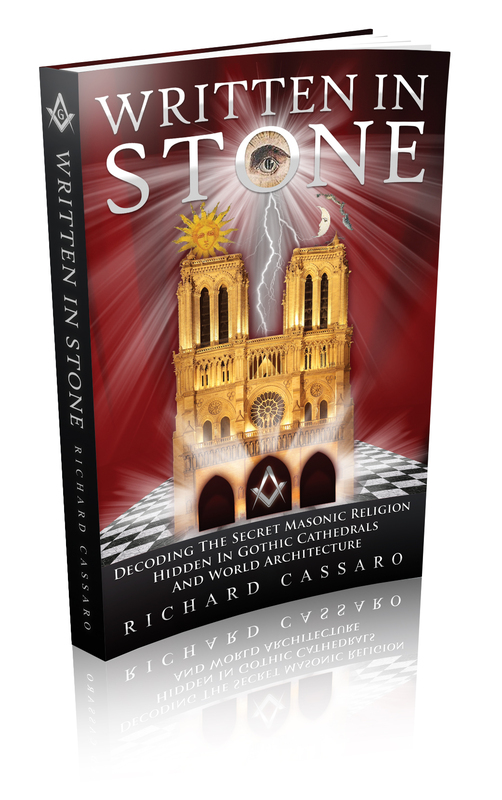 Beliefs that Christians rejected as heretical were hiddenby the Freemasons in the Gothic cathedrals and other monuments. 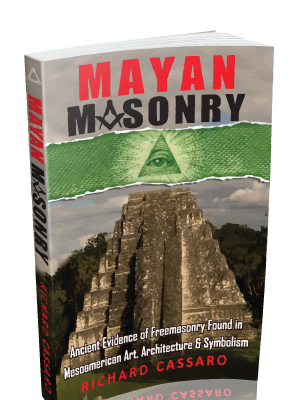 Sadly, among Masons today, few realize the origins and the significance of these building traditions. 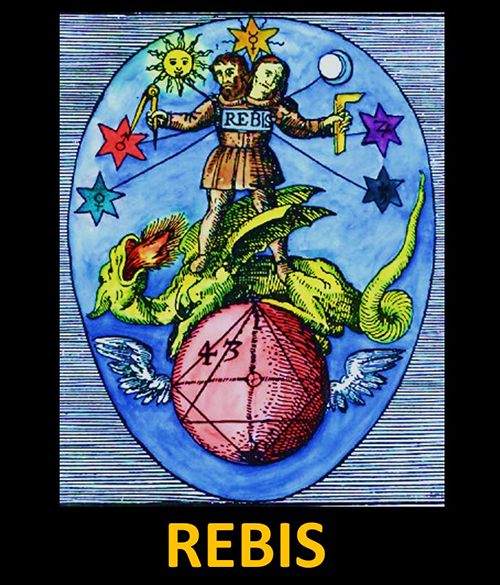 We see a survival of this Masonic “GodSelf Icon” in an alchemical drawing called the Rebis, which first appeared in the work “Azoth of the Philosophers” by Basil Valentine in 1613. Freemasonry´s chief symbols—the compass and square—are in the Rebis´s right and left hands. The Rebis, one of the world´s most esoteric and occult symbols, is a GodSelf Icon. Note the Masonic Square and Compass in the hands. 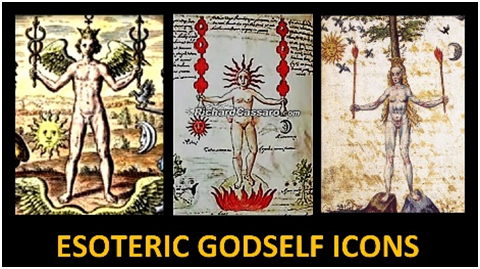 GodSelf Icons from modern esoteric manuscripts share the same posture. As with the Rebis, the sun is associated with the right hand and the moon with the left hand. The central hero is clearly poised centered between these extremes, indicating a balance. GodSelf Icons can be found in esoteric texts penned during the past several hundred years. Note the position of the sun and moon on either side. The Missing Link builds on the case I made in Written in Stone, to show that one of the most important symbols in human history has been overlooked and misunderstood. The GodSelf Icon points to how we can recognize our eternal nature within and achieve the age old aspiration of mind over matter.